It's been a while since I have been here so it is nice to be back. I am trying to find out some information on an Oberleutnant zur See Delius who might have had an aerial victory or ship sinking on April 18, 1917. I am trying to find out if he was awarded an ehrenpries for an event which occured on this date. I have no information that Delius received the Ehrenpreis. I have no infomations about a OltzS Delius within the german navy aviation. Could you give me some informations. I see two Delius (es) in poking around my books (and google) - Rudolf and Heinz. Do you know the names? 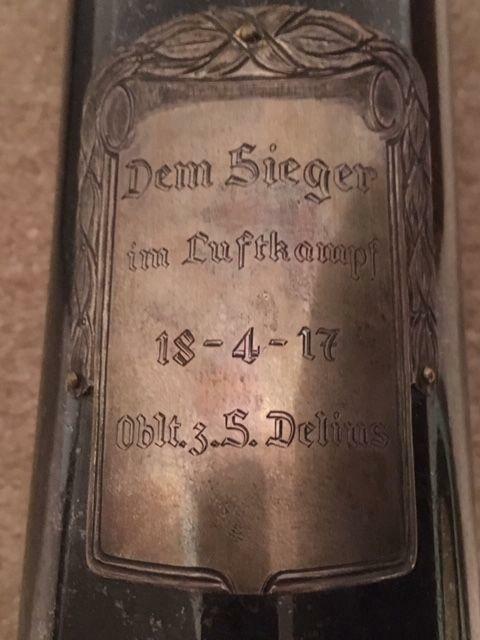 His name appears on a trophy which I purchased (in the mail to me) commemorating a victory which occurred on 18 April 1917. It might be a boat he sunk or a ship. I have seen 3 people listed with the last name of Delius on the Navy rolls, an officer candidate, a Leutnant and a Kapitanlautnant. Would the Navy Officer rolls have any info on him? Thanks in advance. 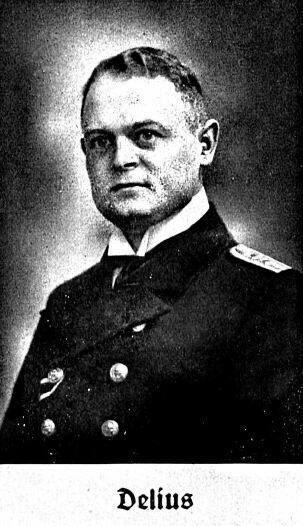 Kapitänleutnant Rudolf Delius appears to have spent most of the war as a torpedo instructor.on SMS Württemberg although he was the recipient of the EK2. He is the only officer of that name who held the rank of Oberleutnant z.S. during the war, although he was promoted to Kapitänleutnant on 13.1.17. Thanks for the info but I don't think this is my guy. S.92 Heinrich - Fähnrich z.S. Diensteintritt 4.7.16; Datum des Patents K.O. 26.4.17 ern. S.96 Fritz - Fähnrich z.S. Diensteintritt 2.1.17; Datum des Patents K.O. 16.11.17 ern. No officers of this name are mentioned in the Rangliste der Deutschen Reichsmarine (nach dem Stande vom 1. November 1924). And none of this three Delius served within the naval air service. I don't have any notice of an officer Delius. I hope we can solve this problem but i have no idea. Bringing this back to the top again with another question....it was mentioned by someone that there was a Oblt z s Delius on the rank list. Could Delius have been assigned to a Zeppelin? Initial comments focused on/assumed he was a naval flying officer. His name does not appear on any list of known Pilots or Observers but if he was part of a Zeppelin crew, it might explain his rank (zur See), why he is not listed as a Pilot/Observer and the different ehrenpreis. non of the existing Delius were in the navy aviation nor the airship service, as I wrote before. Here the entries from the Ehrenrangliste. 1. Kpt.Lt. Rudolf Delius. Delius is listed only with EK2 in the 1918 navy Rangliste. 2. Lt.z.S. Heinrich Delius. No awards listed for him on 1918 Rangliste. This is not an Ehrenpreis. If this piece has something to do with the navy avaition for sure not to Delius. Plaque, podest and eagles are put to gether imho. I don't remind to see a picture of the plaque. Can you post one please. It is "ehrenpreis-like"....what it is is unknown. The dueling eagles are of the smaller variety (smaller than the ones found on the ehrenpreis. They are, IMO, the same size as the "dueling eagles" that Weitze sold a few years ago (not sure if you recall those - it was just a set of the smaller eagles)). Attached is a picture of the plaque. Where does it say Delius was assigned? I see he was on the Konig Albert? Correct. He was on SMS König Albert until end of war "bis Ende". None of the Delius were Olt.z.S. at that time point. Rudolf Delius was already Kpt.Lt. since Jan. 1917 and Heinrich Delius still a Fhn.z.S. The rang makes no sence for me. Hello . Perhaps Oberleutnant zur see Delius was not the recipient of the Trophy but the donator. Thanks for the reply. Normally on the plaques it is the recipient's name. Hopefully another will turn up or perhaps info from the original manufacturer of the ehrenpreis.